New York Jazz Workshop helps Boğaziçi University in Turkey Celebrate its 150th Anniversary! Expertly lead by renowned jazz educators and performers, the New York Jazz Workshop School of Music helps musicians of varying skill levels gain unmatched jazz knowledge and develop professional techniques through weekly workshops, performances, summer intensive programs, and more. 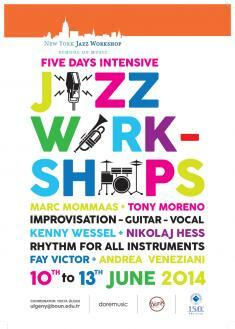 This summer, the faculty and staff of the New York Jazz Workshop has been selected by Boğaziçi University in Istanbul, Turkey, to host a series of intensive musical workshops and concerts for their students from June 10th to the 14th, 2014, to celebrate the 150th anniversary of its founding. Over 150 years old, Boğaziçi University is known for its international academic excellence and is consistently the highest ranked university in Turkey. The New York Jazz Workshop looks forward to bringing world-class musical instruction to Boğaziçi University and expanding its academic partnerships to universities both across the U.S. and worldwide.